Arrived on site around 8 a.m. to find Caomhín in Church Lane; Keeley and Philip were already on site and Tony arrived shortly afterwards. The digger started stripping topsoil at 8.30. He began at the southern end of Trench IV, where the topsoil is really shallow and comes straight down on to chalk. We should hit the square enclosure ditch reasonably close to this end. Puzzlingly, nothing is showing up, despite being half way along Trench IV: no outer enclosure, no outer henge ditch, no bank, no internal deposits. I’m convinced that we’re in the right place, so at this stage, I don’t understand what’s going on. Just as I was writing this, Caoimhín spotted that chalk we had assumed to be natural is on top of a soil deposit, which means we’re in the bank material. There’s no sign of an outer ditch; have we hit a causeway that doesn’t show on the geophysics? I also think I’ve put the trench about 4 or 5 metres too far east. That ought not to be a problem. More disappointing is the fact that we’ve missed the square enclosure’s southern ditch (unless we’ve hit a gap in that, too). We’ve now hit last year’s geotextile in Trench I. It’s a relief to know that we’ve not gone too far south, just too far east. Further north, we have the outer ditch showing beautifully. There have been some struck flints and sherds of prehistoric pottery from the top (we’ve left the pottery in situ but collected the flints from the digger bucket). The outer ditch to the north now appears ridiculously wide and I wonder if we’re dealing with a slightly thicker subsoil here. Interestingly, there was no subsoil south of the henge, no finds and no ditch. We’re back onto chalk only within 5 m of the north end of the trench; this can’t all be ditch fill (it would make the ditch around 10 m wide! ), so are we looking at a natural hollow into which the ditch was cut? After lunch, we started stripping Trench I. It’s much easier following the geotextile than running athwart it. It’s also a lot less interesting to watch the machine, as it’s not revealing any archaeology. 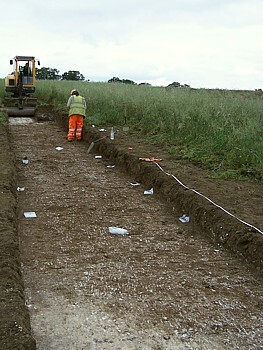 People have moved on to hoeing to clean Trench IV, starting from the north. We’ve already had a flake with scraper-like retouch along one edge (which I’d see as later than the henge, but it does come from the ditch/hollow area, so it could easily be Bronze Age). As the southern part of Trench IV was being hoed, combined with the oxidation of the soil, it now seems that we do have a ditch on the southern side of the bank. One by-product of putting the new trench a little too far to the east is that we can now see with some clarity a whole arc of the chalk bank of the henge. This is very gratifying! 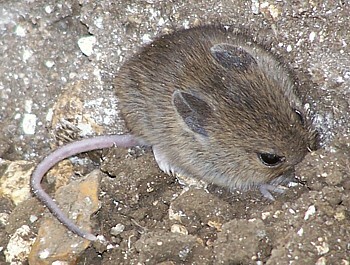 There was an Alice in Wonderland moment when a dormouse was spotted, dozy and probably a little shocked at being rudely interrupted from its slumbers by the mechanical digger. It sat blinking on the edge of the trench. I hope that it finds its burrow before one of the local raptors finds it! We have had a reasonably productive day. We have stripped around 120 metres of trench of topsoil (about 240 m2), much of Trench IV has been cleaned, the fencing is in place and a lot of the tidying of the walkways around the edge has been completed. Tomorrow, we will need to finish the initial cleaning, get everything planned and, if all goes according to plan, we can get excavation of the ditch section at the west end of Trench I underway. 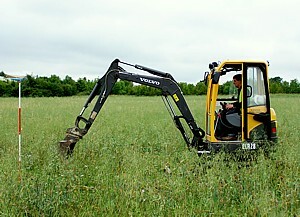 Posted on 27 July 2011, in Fieldwork, Stapleton's Field Dig 2011. Bookmark the permalink. Leave a comment.